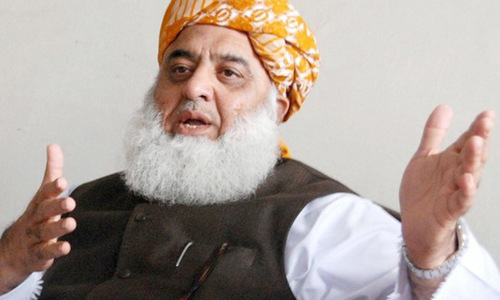 MIRAMSHAH: Jamiat Ulema-i-Islam-Fazl chief Maulana Fazlur Rehman said on Sunday that the sole purpose of National Action Plan (NAP) and merger of defunct Fata with Khyber Pakhtunkhwa was to appease India and America. Addressing a big rally in Mirali town of North Waziristan tribal district, he said that his party had opposed both the NAP and merger of tribal districts with Khyber Pakhtunkhwa. Tahaffuz Namoos-i-Risalat rally was organised in the main town which was also addressed by Maulana Abdul Ghafoor Haideri, opposition leader in KP Assembly Akram Khan Durrani and other party leaders. 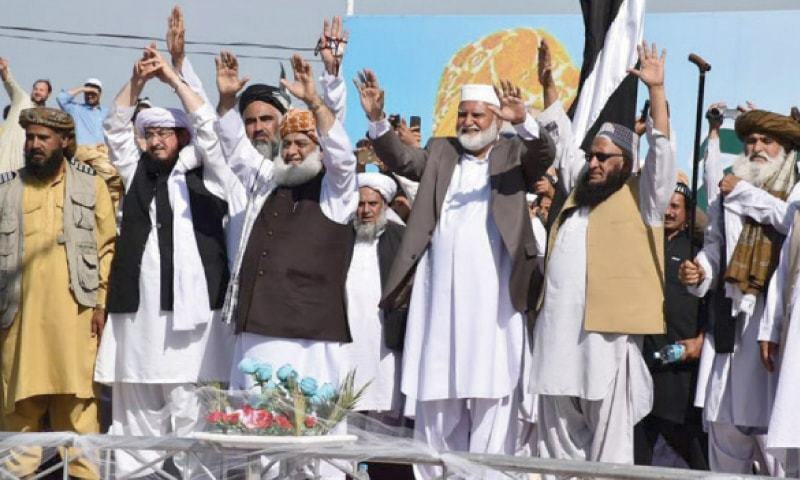 This was JUI-F’s first show of power in the militancy-hit district after its merger with the province in May 2018. The government will hold elections in the merged districts for the provincial assembly before July next. Preparations for the elections in seven merged districts and six sub-divisions are underway as several candidates have started their campaign. 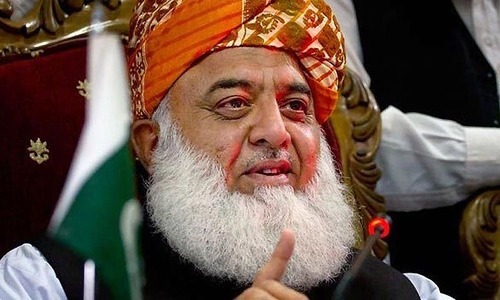 Maulana Fazlur Rehman said that at present neither Frontier Crimes Regulation (FCR) nor police system existed in the merged districts, which had created a complete legal and administrative vacuum in the erstwhile Fata. “The sole purpose of merger was to appease America,” he said, adding that the neighbouring countries, including Afghanistan, had been annoyed over the decision. He said that people of tribal districts were already living miserable life and their agonies had increased after the merger. He said that JUI-F was not in favour of NAP that was unveiled after the terrorist attack on Army Public School, Peshawar, on December 16, 2014. He claimed that the 20-point plan was introduced to pacify India. He said that nobody was taking notice of the rights violations in tribal districts. He added that the tribal people were not taken into confidence before the merger. The JUI-F chief said that the sitting rulers would not be allowed to accomplish their hidden agenda that included recognition of Jewish state. He said that attacks on religious scholars were part of international agenda. He said that Mufti Taqi Usmani, who survived an assassination attempt in Karachi, was a neutral and non-controversial figure. He said that seminaries and ulema were under attack across the country, adding that the government could not stop the caravan of Namoos-i-Risalat through such tactics. He claimed that the government was trying to promote indecency in society in the name of women’s rights. The Maulana said that a fake government had been installed in the centre which could not take pressure. He alleged that the Indian pilot was set free under the US pressure. He said that JUI-F had started organising million marches against what he called anti-state and anti-Islam policies of the government. He said that a rally would be organised in Khyber tribal district on April 21. He said that his party would also give a call for a million march in Islamabad. WOUNDED: A man and his six-year-old daughter were wounded in a landmine explosion in Boya tehsil of North Waziristan tribal district on Sunday. Officials said that Gul Dada and his daughter, Salma Bibi, were walking near Norra Manza checkpost when a landmine went off. Military personnel shifted the wounded persons to the hospital. Most other agents work for money. This one works for free. Agree with Maulana, the merger has increased our problems, no development,no jobs, no schools, no hospitals, no new recruitments, no justice, nothing has started so far. Only hollow slogans by PTI and every week new committees are made and break. I don't even feel sorry for this fake mulana. Somebody ask him that what is his problem with NAP? Why is he scared if he's clean? "He said that JUI-F was not in favour of NAP.." Heck were you in favour of Pakistan? Keeping ungoverned areas in control is state ability and sucess. @Javed, He has got his ill gotten consignment in advance! You Mr Fazl have been anything but Fazl for our nation... in the past and the present. Please kindly for once think of our nation before your own personal political gains. Thank you. @Fastrack, ... you are right, not for free but for a house in ministers enclave, car and all entertaining which goes with it but doing sod all for it for decades. I don’t understand why we are so linient with traitors in this country? What more proof do we need? Let them rot in jail because they are all working against Pakistan including Sharifs, zardaris and others. Fazl is claiming that the PTI government is an Indian agency. Some IK fans will swear that Fazl is an Indian agent. Poor India. Any proof? You are the appeaser for India and US. You are an anarchist working for self interest to the detrement of Pakistan. Shame on you. Fazlur Rehman went to the American Embassy and gave them promises to execute their policies in exchange for their support for his PM-ship. This man is as doubtful as they come. I am glad the voters discarded him. Fazl a seasoned politicians must be steeped in ignorance if he does not know that NAP was passed after extensive discussions in Parliament, not Indian Parliament but Pakistani Parliament. No development work started yet. Delay by PTI is something that they have to answer (at maximum the delay is 6 months). Pls also ask the other (PML-N and PPP) the delay on their part amounting at a minimum to 5 years each! FATA is Pakistan and Pakistan is FATA. Merger is not a magic spell to solve all FATA problems in a blink. It will...take some time. Whoever talks, whatever they talk they pepper it with anti India and anti US statements that is all. Real issue nobody is bothered. What a shame! Why are people like him resisting NAP implementation? It's good for your country. Clean the mess and shine. Safe environment brings FDI. Pakistanis deserve better future. FATA merger and NAP was poorly implemented. He said that seminaries and ulema were under attack across the country,...." Why this fake statement? Can you give a list? creating unnecessary controversy. we cannot be successful until and unless People like fazl-ur-Rehman, Nawaz Shraif, Shahbaz Sharif, Asif ali Zardari and Bilawal Zardari should be given examplery punishment. @Ob, if BRT project could be completed in six months as was claimed by PTI , than why developments works couldn't be started Fata in six months. A big hurdle in the progress of Pakistan. spreading poison in our society in the name of Islam.